Thanks to @andyhutt for the heads up on this one. Love this site for creating your own animated presentations. Here’s one I made earlier (mind out if you have speakers on for the annoying jingle at the end though!). It’s got a really simple to use interface with fab features too. 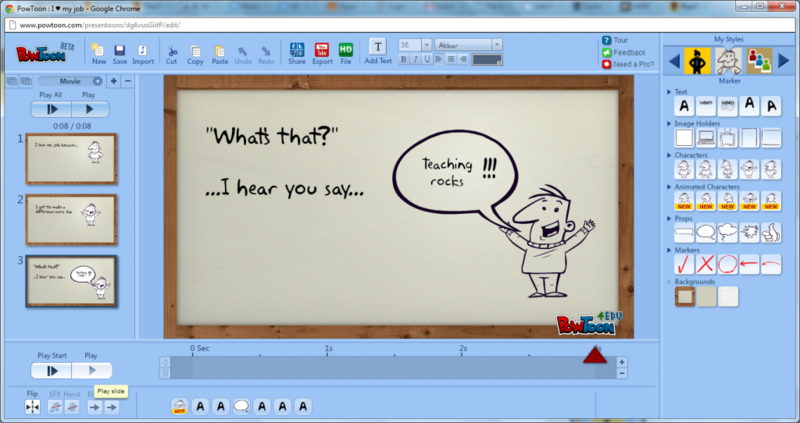 Add in your text, build in your presentation, animations, images, music, you can even add your own voiceover. User interface for creating your own ‘PowToon’! Check it out now by visiting http://www.powtoon.com – watch to sign up for the Edu version too #tweachers!